Two views of the Wellington depot. 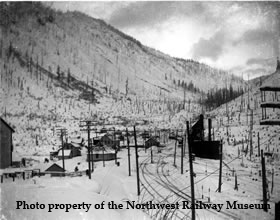 The second photo was taken from a height, perhaps from the top of a boxcar. 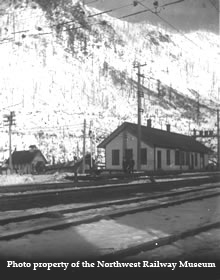 Depot was moved to this location in summer 1910 and the school house can be seen behind it. 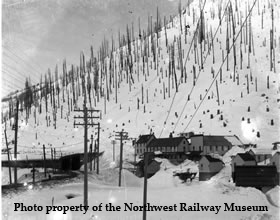 Original location was near the Bailets hotel just east of where the concrete snow shed was constructed.. The depot and town were renamed Tye by the railroad on October 15, 1910, but the post office and other government agencies contiued to identify the community as Wellington. The depot was the center of town life, especially in a railroad company town. Through here, all communications with the outside world arrived or were initiated. Mail arrived and departed. And so did workers and their families. 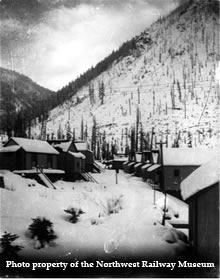 A view of the Bailets hotel and the concrete snow shed. 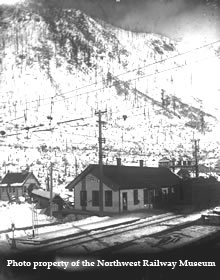 The snow shed was built almost exactly where the avalanche came down in 1910. All the land in Wellington was owned by the railroad and so workers and their families had to rent or lease. Residents pose with their Wellington home. 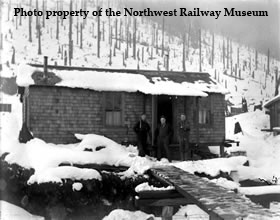 This concrete snow shed was constructed in summer 1910. 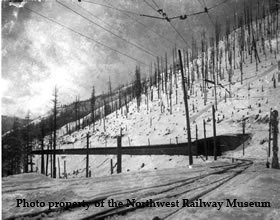 It protects the track that was devastated by the avalanche on March 1, 1910. 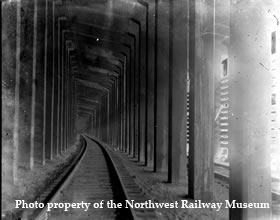 It was astoundingly expensive to construct and no other completely concrete shed was ever again built on this line. Inside the concrete snow shed. Wellington as seen from above the snow shed. Coaling tower is seen in the middle distance. It was originally located behind the photographer and was in the middle of the avalanche. It, however, was spared. 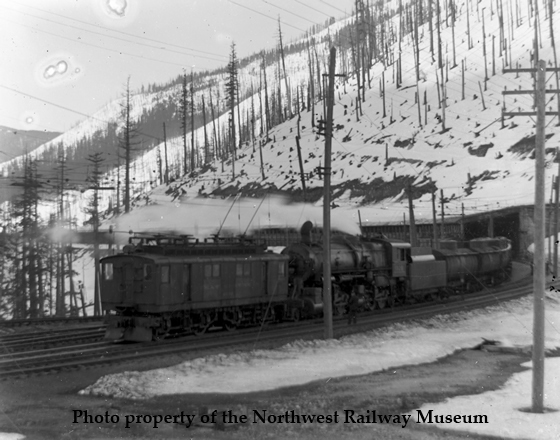 Steam locomotive 1009 heads an eastbound freight, Extra 1009 east (there are white flags on the front of the locomotive designating it as an extra train). It has paused near the Wellington (Tye) depot to attach an electric locomotive that will pull the entire train through the Cascade Tunnel.